So here is my second submission, but in fact my third wall. Don't look for the second, it is not finished yet. This wall take me more time than expected (I'd say about 25-30 hours). The idea came after seeing episode 7 of "Angel Beats!" 'cause I like this moment where Kanade let the butterfly go, so I took a snaptshot and go to work. First I've vectored Kanade from this pic and then Otonashi from Scampi's scan . After that, doing the BG was hell for me. The sky is the one of that picture, vectirize and with some effects. The flower field have been made with the help of that pack but I had to modify them a lot. I'm waiting for Ep 14 (ova) ..... ? otonashi looks a little unnatural, but id say you hit it. i love this couple very much! I love your wallpaper. Thought, the characters doesn't look like the original it still good. The scenery and background or flowers adds to the nice touch. 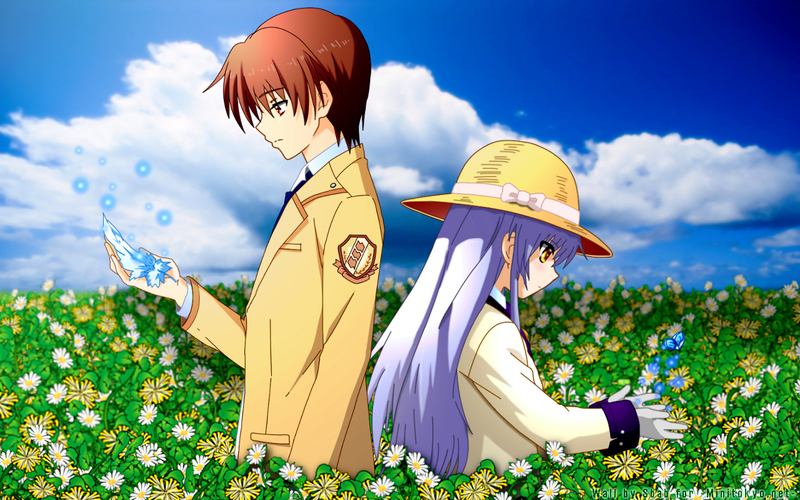 Waaa, Kanade-chan and Otonashi in flowers garden. Background and characters are so beautiful.